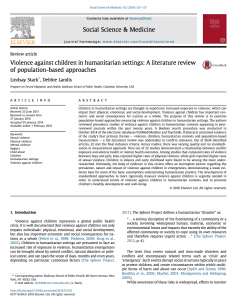 Lindsay Stark and Debbie Landis conducted a review of 22 prevalence studies of violence against children in humanitarian contexts to examine population-based approaches measuring violence against children. Ultimately, the body of evidence in this review reveals a lack of standard practice in measuring violence against children in emergencies; shows limited evidence of whether and under what conditions violence against children increases; and reveals that fundamental assumptions underpinning violence against children in emergencies are not data-driven. The development of standardized approaches to more rigorously measure violence against children is urgently needed in order to understand trends of violence against children in humanitarian contexts and to promote children's healthy development and well-being.